Precious Pistachio Rollover Biscuits is a joyful addition to your cookie tray. 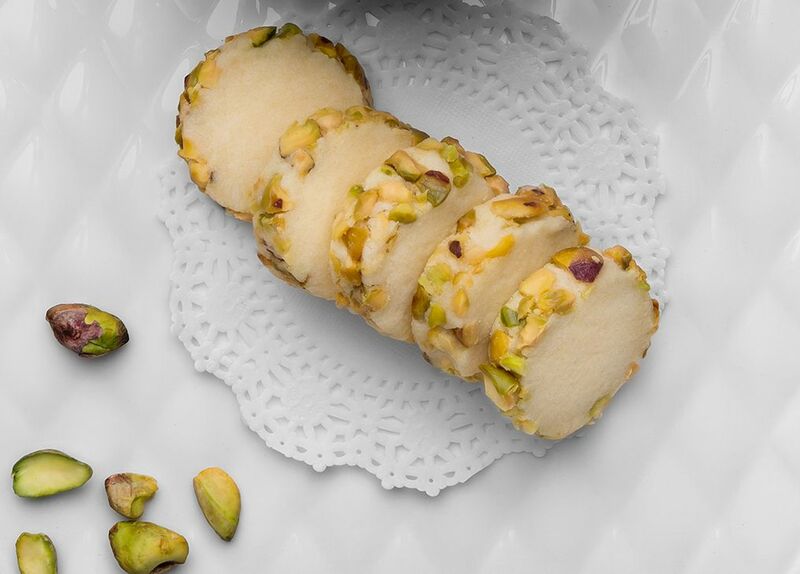 The finely chopped pistachio in every bite of these sumptuous cookies, alongside the perfect blend of butter and nutty goodness, is surely a delightful treat to be served during this prosperous season. Recipe and photo courtesy of SCS Butter. Cream together butter and sugar until light and smooth. Sift together flour and salt then fold into butter mixture to form a soft dough. Divide dough into half, make two rolls with 3cm diameter and 30cm length. Set in freezer for 30 minutes. Cut the rolled dough into half. Brush outer layer of dough with egg white. Pour crushed pistachio nuts onto a parchment paper, roll over each dough to coat. Slice dough into 8mm thickness, transfer onto a baking tray. Bake at 160°C in a preheated oven for 15 minutes or until cooked.